PHOENIX — Sean Payton isn’t going away. Which means the New Orleans Saints aren’t going away. Which means the burr in the saddle for NFL commissioner Roger Goodell on the issue of instant replay and officiating isn’t going away. Essentially, the league’s power brokers have roughly the next 24 hours at the owners meetings in Phoenix to make some meaningful changes. And through the first two days of deliberations, nothing has been definitive on the matter. That is, nothing beyond a debate that has featured more disagreement, less movement – and Payton once again airing out his feelings about the need for change. 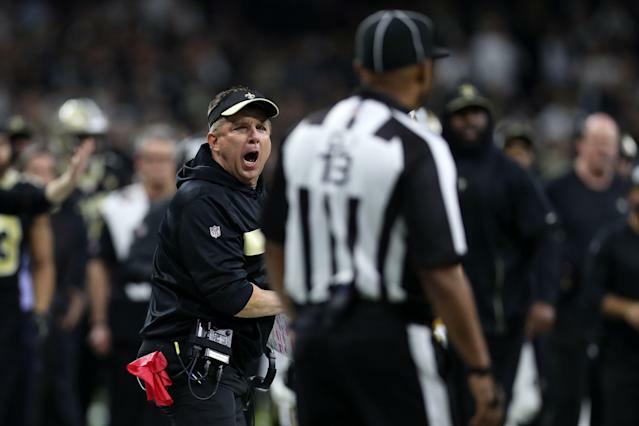 Payton’s reference (and driving motivation to keep prodding the NFL) is the open wound that still remains for New Orleans: the blown pass interference call in the NFC title game that arguably cost the Saints a trip to Super Bowl LIII. The same officiating mistake that Goodell didn’t seem inclined to worry about when he spoke at the Super Bowl. And the same miscue that has kept instant replay and officiating a hot-button issue through the NFL’s scouting combine … into these owners meetings … and likely right through the summer if the status quo remains. Already, there have been closed-door debates about installing a sky judge for blown calls (which many in the NFL don’t appear to support), as well as opening up unflagged penalties for some form of instant replay (which also has been rife with disagreement). But Payton has remained adamant that something has to happen this offseason. And as a standing member of the league’s competition committee, he’s going to have all the inside details to spill if some of the current proposals on the table fail in the next 24 hours. Among them: One would make pass interference fouls reviewable via instant replay. Another would make pass interference fouls, roughing the passer fouls and unnecessary hits against a defenseless receiver all reviewable via replay. Interestingly, neither of those changes would have altered the outcome of the blown call in the NFC title game because neither would open unflagged plays into the replay system. However, passing either would be a significant concession by the league after it has long refused to open “judgement call” penalties to the instant replay system. That concession appears to be exactly what Payton is looking for as retribution for what happened in the NFC title game. He appeared to go even further this week, once again taking a swipe at the quality of calls the NFL is inviting when it has part-time officiating. The next 24 hours will answer some of those questions for Payton and the league. Not to mention the many months that follow it – and the reality that the Saints aren’t going to let the NFC championship debacle fall by the wayside anytime soon.